Most of us who now airbrush nearly every model we build started off with simple devices we could easily control. In my case, it was a Badger Model 350 spray gun with the “Propel” can in 1968. I used that through 1973 when I was introduced to “real” airbrushing by a chap named Pete Lange in California. I bought a Binks Wren and compressor and it was off to the races. Later on I moved up to a Badger 350 for area spraying (base coats) and a Badger 200 for fine detailing. This worked well, but in 2002 my wife got me (well, let me buy) a Badger Model 155 Anthem which was my first really good airbrush. Precise, easy to adjust, and able to hold a fine line, the Anthem was my “go to” brush for nearly nine years when I also got a Badger Model 105 Patriot for detailing. The Patriot was very much like the Anthem with the exception of a fixed color cup. I had never used on as I didn’t like the open paint, but after trying it found I liked the fact it could be used for touch-ups or detailing as well as spraying weathering powders in a carrier medium. This year at AMPS 2012 Ken Schlotfeldt of Badger was present with his full line of brushes, and I saw the new Renegade Krome series brush. This was an even more precise airbrush than either the Anthem or Patriot, and in a day and age where more and more of a model’s appearance is based on its finish it seemed to be just the ticket. The Renegade Krome (apparently RK-1 to its friends) comes in a very handsome box with aluminum reinforced edges and thick foam padding inside. The packing holds the brush and a compressor hose converter (it will allow the brush to mate with hoses from either Harder & Steenbergen or Grex compressors). Also packed in with the brush are a second tip jet assembly and needle. The brush is a bit different from previous ones. 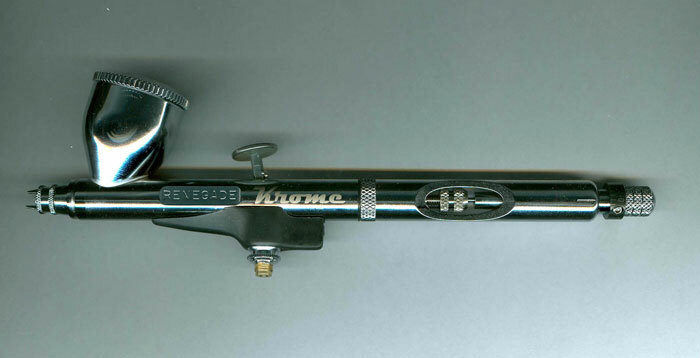 It is about an inch longer and better balanced, and in the case of the “Krome” model is chromium plated, not nickel plated. It has several new features, such as a close-fitting metal cap vice a plastic one on the fixed paint cup. It comes with an ambidextrous thumb rest under the trigger for more comfort and better control, and it feels much better for that reason in my (right) hand. The trigger button is larger as well. The brush also has a “crown” cap over the jet rather than the more common cup-shaped protector; this is reportedly to prevent backblast when painting at close range and to permit air to spill to the side rather than blast paint back into the jet. The biggest difference is the fact that this brush combines the action of a double action brush (press down for air, back for paint flow) with media flow control like a single action brush. Called “Stopset” by the company, a knob at the rear of the brush - with a 0 to 10 numerical readout – controls how far back the trigger can be pulled when the brush is in action. This ensures that the same amount of paint will be provided every time and that the user cannot accidently pull it too far to the rear for that unpleasant “SPLAT” moment. Most of the brush can be “field stripped” for cleaning, but unlike earlier models the jet holder on the front of the front shell has been factory installed and is not to be removed (as cand be done with the Anthem or Patriot). Overall this is a very nice brush and is just what is needed for all around painting of today’s armor models, down to very fine lines.